Princess Cruises will offer eight ships during the 2019 Europe cruise season! Explore the Mediterranean, Baltic, British Isles, Scandinavia/Russia and more with cruises ranging from 17 to 45 nights in length. 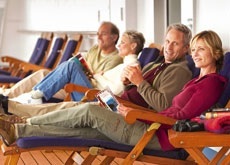 Or enjoy an extended holiday with one of our Europe Cruise tour packages! Let the journey broaden your horizons and renew your spirit. It's easy to get lost in the routine of daily living. Which is why it's so important to step away and reconnect with your life. And there's no better way than on a cruise with Princess. Out at sea, you're free to relax, unwind and feel the joy of the journey. More than just a vacation, embark on an adventure of thrilling discoveries and enriching experiences - unexpected moments that reawaken your sense of elation and wonder; exotic tastes and cultures that expand your horizons; and shared times with family and new friends on board that you'll never forget. New Princess offerings inspire your soul - like creations from celebrity chef Curtis Stone and Discovery at Sea programs to theatrical productions from Broadway legend Stephen Schwartz and more. You'll come back renewed with wonderful memories, and see the world in a whole new way. Awaken each day to a different breathtaking landscape and the promise of culture, cuisine and world-famous landmarks. Unpack once and see more of Europe! Europe beckons with glorious history, fabled cities and spellbinding beauty. In the shadows of epic monuments, you will discover storybook towns hidden behind medieval walls, timeless gems and a taste of la dolce vita. Cruise to Europe's most enchanting ports of call and discover with Princess the lands of legends and kings. See such UNESCO World Heritage Sites as the Hagia Sophia in Istanbul, the Colosseum in Rome and architect Antoni Gaudi's masterpieces in Barcelona. And that's only the beginning! Immerse yourself in all the Mediterranean has to offer, including More Ashore with overnights in Venice and Barcelona. Taste risotto in Venice or Spaghetti alla Carbonara in Rome or pizza in Naples. You could sail here every year and taste something new every time. Far away from the daily grind, there is Europe, where the outside world ceases to exist. There, you'll relive history in legendary cities like St. Petersburg. And fall in love with the dramatic beauty of Venice. You'll be charmed by Parisian culture. And bask in the warmth of Greece. In places like these, a vacation becomes much more than a break from the routine. It becomes a complete escape. At Princess Cruises, our goal is to ensure your vacation is all you imagined it to be and more. Which is why everything from our ships to our service, is designed with you in mind. Princess was recently voted Best Cruise Line in Europe by the experts travel agents who read Travel Weekly. Come aboard and you'll agree, we are the perfect travel companion for your voyage. A Princess ship is more than your home away from home - it's a floating retreat filled with entertaining, engaging options for enjoying each and every hour. Choose to settle in on a deck lounge by our sparkling freshwater pools, or fill your schedule with wonderful activities. Best of all, how you spend your day is up to no one but you. Classic Europe - With over 40 award-winning itineraries on small and large ships, Princess brings you both the most popular destinations and less-frequented ports throughout the Mediterranean, Northern Europe and the British Isles. A vacation should be about more than just getting away. You should return rejuvenated and renewed - with new memories, new perspectives, and possibly even new friends. It's afternoon in the Atrium - the central hub of your Princess ship. And much like the quaint city squares you'll visit ashore, the Piazza on Deck 5 is bustling - people are laughing and conversing over a latte or glass of wine as they enjoy a folklore performance nearby. The experience of your destination infuses every moment aboard. As you get to know each deck and every restaurant and lounge, you'll begin to feel more and more at home. 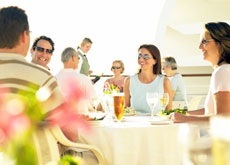 Returning to the ship each day, relaxing at dinner and sharing stories with fellow guests about your discoveries ashore, you'll find your life becoming richer in ways both large and small. The Piazza, found on most ships, evokes a European plaza where you can enjoy a cappuccino and panini, and regional entertainment. Inviting venues on the Piazza include the International Cafe and Vines wine bar, voted one of the Best Wine Bars at Sea by USA Today. Enjoy fine wines from around the world, including many carefully selected from the regions you are visiting and the largest selection of Super Tuscans at sea. Discover signature experiences including the on-deck oasis, The Sanctuary, the Lotus Spa, Movies Under the Stars and more. The Princess staff hail from around the world and specialize in Princess' signature friendly, attentive service - just one reason Princess was named Cruise Line with Highest Client Satisfaction by TravelAge West WAVE Awards. Be sure to visit the experts at the Shore Excursions desk - they delight in helping guests realize their dreams. The day dawns with a dazzling realization - your time is your own to do exactly as you please. Which is exactly how a vacation should always be. On your Princess ship, whether you feel like socializing, exercising or finding a solitary spot by a pool with a good book, Princess always has just the right spot for you. Each day, you'll have practically endless possibilities - learn about the next day's port in an engaging presentation, get a manicure, go shopping and then head to a wine tasting. Best of all, you can follow your mood wherever it takes you, and return home refreshed, rejuvenated and renewed. Activities from dawn to dusk keep you engaged and entertained. Attend a champagne art auction, join culinary demonstrations, learn to wave a flower lei or play the steel drum to a Calypso beat. Enrichment programs offered on board help bring the regions you visit to life with courses on art and architectural history, destination photography or scrapbooking. Spa offerings help you decompress in the Lotus Spa or on deck at the tranquil oasis, The Sanctuary, and include regional touches like Turkish Hammam steam baths. Fitness buffs will enjoy working out in the state-of-the-art fitness center, with classes like yoga and Zumba. Princess has been named Best Onboard Shopping for six straight years by readers of Porthole magazine. Visit the boutiques for homegrown treasures like fine Italian leather, Russian Matroyshka dolls, New Zealand Puau shell gifts, Korean dolls and Taiwanese silk bags, as well as commemorative 50th Anniversary gifts - all at substantial tax- and duty-free savings. Evening is a special time on a Princess ship. Dinner is done, but the night has just begun. And you can feel the excitement building throughout the ship as you and your fellow passengers consider the bounty of choices for what will undoubtedly be an unforgettable night - every night. Endless entertainment ranges from street performers at the Piazza to top headliner comedians featured on Comedy Central to renowned illusionists and Princess Pop Star karaoke. Bars and lounges provide fine cocktails and a great place to enjoy everything from cool jazz to the latest top-40 tunes, and include the nautical-themed Wheelhouse Bar, named Best Cruise Ship Bar by Cruise Critic. Movies Under the Stars, our outdoor big-screen theater, brings you contemporary feature films, classics, sporting events and entertainment. Original musical productions you can only see on a Princess ship feature world-class performers, renditions of popular hits from the likes of Bruno Mars, Beyonce and Michael Jackson, and Broadway and opera classics from West Side Story and My Fair Lady. Dance the night away in the ship's various night clubs, featuring state-of-the-art sound and light systems and modern decor or, enjoy world dances like flamenco, waltz, samba, hula, disco and more throughout the day. Delicious fresh casual fare is prepared from scratch each day, all day, and offered in venues throughout the ship. Neapolitan-style pizza out on deck, from classic Margherita and pepperoni to daily specialty pies, has been called Best Pizza at Sea by USA Today. Traditional English pub lunch features fish & ships, bangers and mash, British ales and other bonny bites. Special 50th Anniversary menus will feature the best dishes from over the decades and our exclusive new Princess Seawitch micro brewed beer. Chocolate & wine tastings: sample decadent chocolate bites with our selection of premium wines using recommended pairing by Norman Love. Chocolate spa treatments: what better way to cap off a premium chocolate experience than with the hydrating, anti-oxidant benefits of a chocolate body treatment in the Lotus Spa. Main dining includes out trademark Anytime Dining - eat when and with whom you want - as well as classic Traditional Dining, at the same table with the same wait staff each evening. Specialty restaurants offer variety such as the Italian regional fare at Sabatini's or the refined steaks, chops and seafood at Crown Grill. Delicious local influences make their way into special menu creations from zesty tacos in Mexico and lamb tagine in the Mediterranean to delicious Alaska salmon and fresh Japanese sushi, served with flavorful regional wines, beers and cocktails. And don't forget daily-made Italian gelato for dessert on every cruise! The entire Princess fleet has been inducted into the prestigious Chaine des Rotisseurs gastronomic society. A dedicated room steward greets you each day by name and is there not only to keep your room tidy, but to handle any special requests you may have. Stateroom amenities include 100% Egyptian cotton linens and duvet, down pillows, luxurious sundries, flat-screen televisions, refrigerator, wireless Internet connectivity and much more. Special in-room programming such as Princess-produced documentaries and specials that let you learn about your destination from the comfort of your stateroom, as well as The Wake Show, our entertaining and informative morning program highlighting the day's events onboard and ashore. Mini-Suites and Suites offer more space and a whole variety of additional amenities from welcome champagne and fresh flowers to luxury mattresses and priority disembarkation. With Princess Cruises, young kids and teens have their own kind of fun and their own place to hang out. Our youth and teen centers are fully equipped with everything from the latest video games and movies, to splash pools, ping-pong tables, jukeboxes and game tables. Princess Pelicans (ages 3-7), Princess Pirateers (ages 8-12) and Off Limits (ages 13-17) will keep your kids busy while you have that romantic dinner for two or just need a little spa time. A Princess cruise is a complete escape for all passengers, including those with disabilities. Every Princess ship has a wheelchair accessible staterooms, All in One Kits including TTY, Assistive Listening Devices and Braille signage. We also welcome service animals. Visit our website, call a Princess cruise consultant or ask your travel agent for complete information on facilities and services. And don't hesitate to tell us how we can make your Princess cruise more accessible for you. 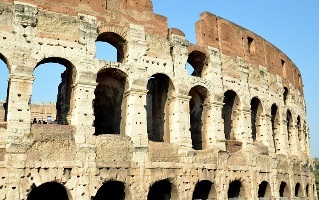 Mediterranean Cruise Special - 11 Days Rome to Barcelona From $1909 US!